Congratulations on the marvellous compilation of everything to do with the stage version of Cottage To Let. I saw the subsequent film at the National Film Theatre on Monday, in the company of Leslie Banks's daughter Evangeline. She is my second cousin, my mother having been Leslie's first cousin. Evangeline remembers as a young girl travelling with her father to Inverness and Aberdeen to see the play on tour. Interesting that your grandmother Greta was born in Hoylake. That was also Leslie Banks's family home, his parents having moving there from Liverpool during his early childhood. I wonder if he and Greta knew each other there. William, Evangeline was only a child when she saw CottageTo Let and remembers next to nothing about the cast. But happily you have done such wonderful research that you already know a very great deal about your distinguished grandparents. Once again thanks for all the memorabilia you have placed online. I've alerted several friends to the link and all have been astonished by the thoroughness. 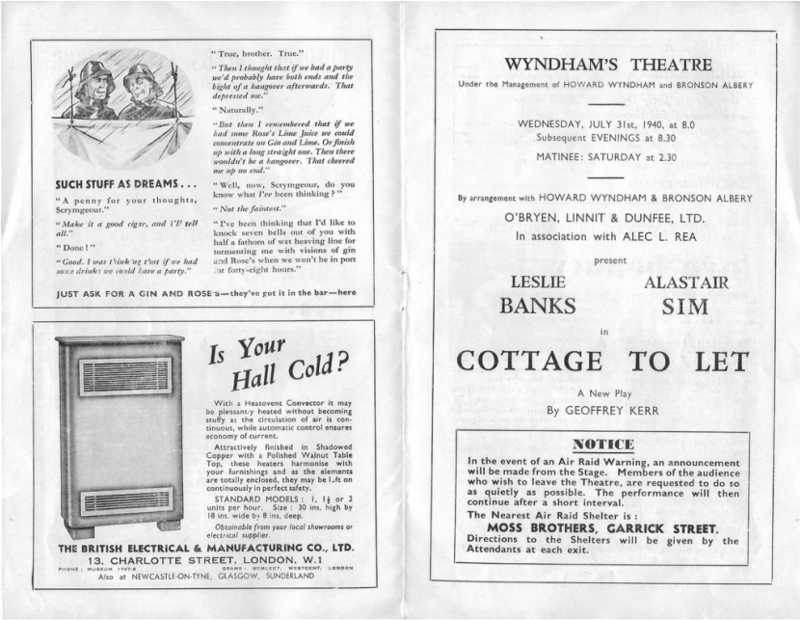 "Cottage to Let" played at the Wyndham's Theatre, London, from 31 July to 7 September, 1940, and then 3 May to 19 August, 1941. 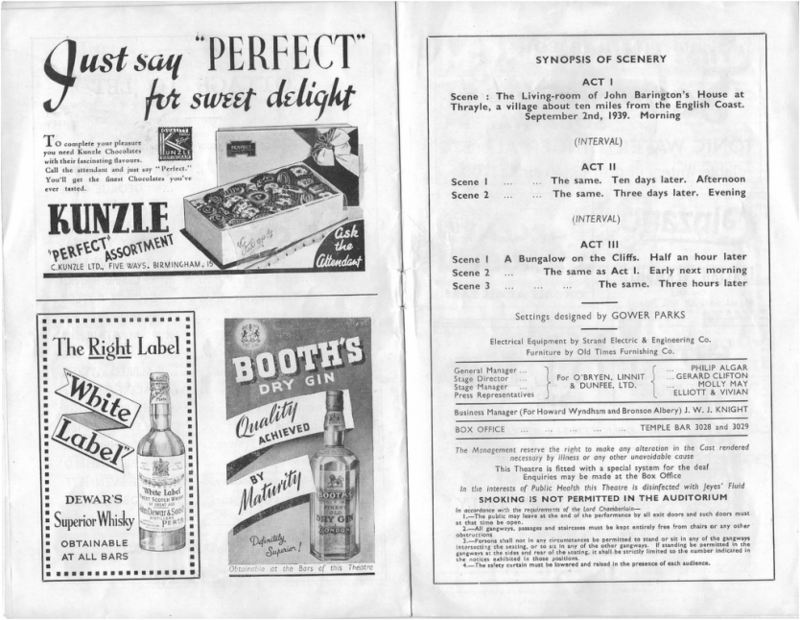 It moved to the Opera House, Manchester, and was reviewed on the 26 August, 1941 (see below). When London theatres closed due to the blitz, the production toured army camps to entertain the troops. I REMEMBER being taken as a child during the last war to see Seven Days' Leave at the Lyceum. It was a magnificent play which has had too few successors in this sophisticated war : it ended in the destruction of a German submarine, a satisfactory conclusion in 1917 when our tonnage-losses were even greater than they are now. I have a rather dubious memory of the heroine swimming out to the submarine and then appearing on the stage in a wet macintosh—this seems improbable, not that probability Is an essential feature of a war - thriller. 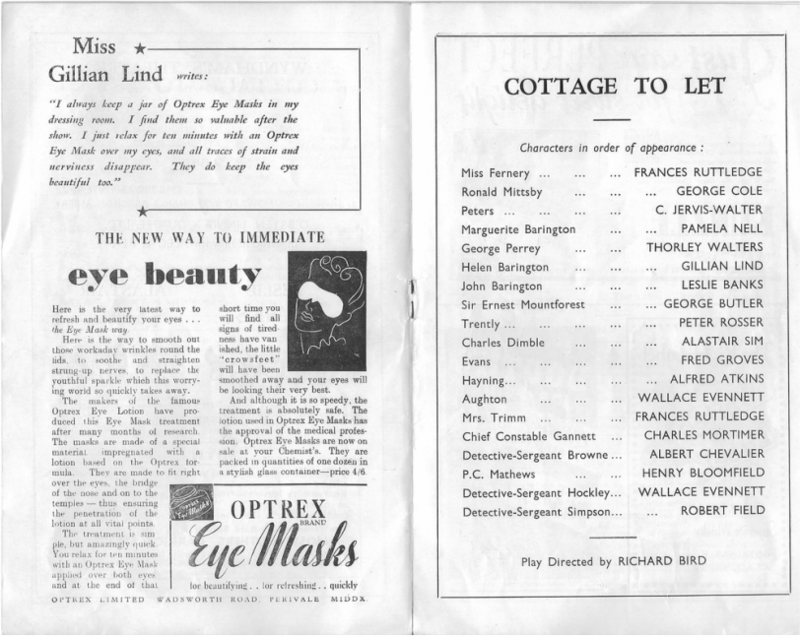 Cottage to Let, our nearest modern equivalent, also ends satisfactorily with a U-boat sunk and a spy brought to justice: it is about a scientist (Mr. Leslie Banks) who has invented a drug which destroys the sense of pain: he alone knows the formula, so a Ger- man agent (rather surprisingly Mr. Alistair Sun) arranges to have him kidnapped, put on board a U-boat and taken to Germany, while evidence to show that he has murdered his assistant and sold himself to the enemy is carefully planted. The sedate drawing-room-set inevitably gives place to the lonely bungalow on the cliffs, where the effects include revolver-shots, flares, bombs and aeroplane-engines. 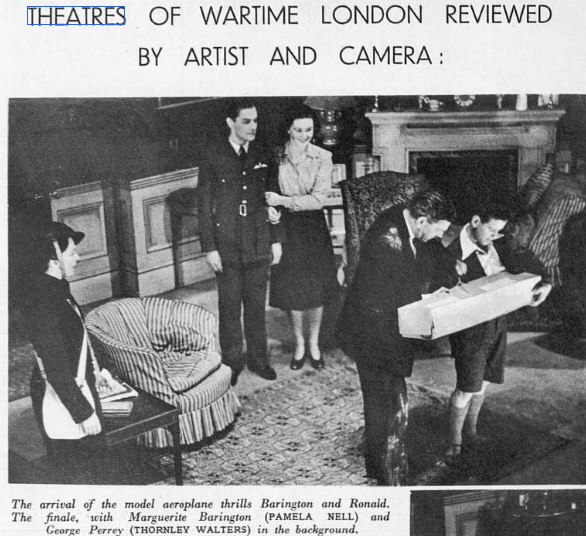 The London audience reacted more nervously to the flares and bombs than when this play was first produced in the days before the blitz. When this play is funny it is very good indeed (and it isn't often—except in the lonely bungalow—serious). How could it fail to be, lightened with the foolish charm of Miss Gillian Lind as the vague scientist's even vaguer wife—the pencilled oriental eyebrows, the scimitar of young white hair, huge dark glasses and voice lacquer-deep; and with Mr. Sim as the agent disguised in brown plus-fours as "a man who goes out and shoots things "? The long agile simian leaps, the tortuous rubber-mouth, the rich giggle and the expressive hand-clasps, the too-ready intimacies (" You can trust old Charlie Dimble ") are familiar enough in the service of comedy. Waiting with a knife in his gloved hands to stab his nervous colleague or sadly watching his elaborate pack of cards tumble, he gives us a hint of what he could do with the sinister, even the tragic. 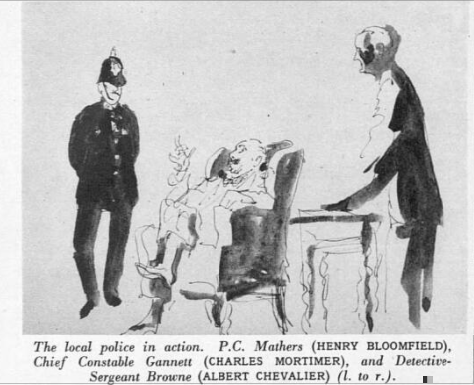 But in spite of these admirable players—and ot Mr. Fred Groves as a policeman disguised as a butler (" had a couple of weeks at a school for butlers in the Cromwell Road "), and Mr. Charles Mortimer as a pig-headed chief constable—the honours must still go to Master George Cole as the evacuee-schoolboy who is following in the steps of Sherlock Holmes—a bit unscrupulously (" I'd get nothing if I waited for people to give me things "). This is as fine a bit of natural acting as you will see in London in a part that has all the swagger of a story in Chums. 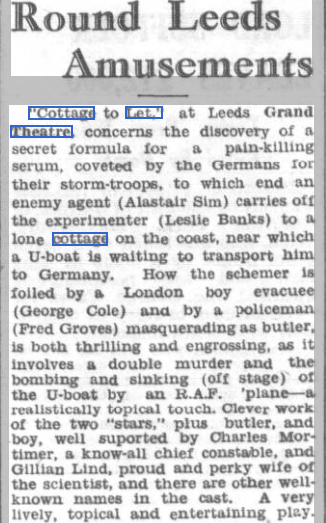 The Manchester Guardian - 26 August, 1941 (With kind permission of the Guardian News and Media Ltd). 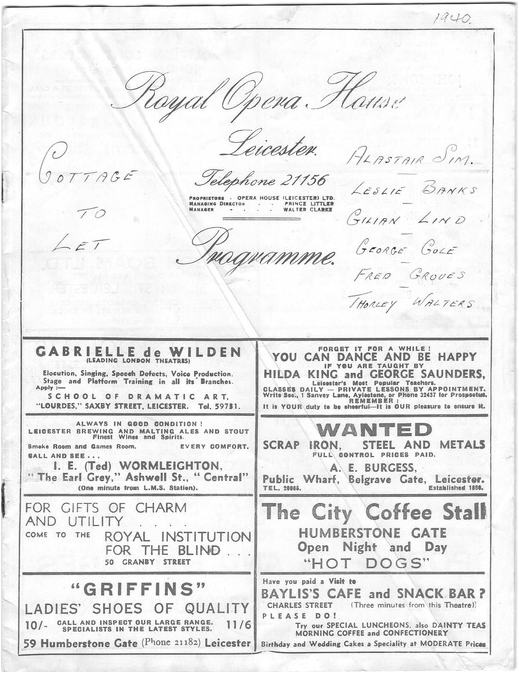 Geoffrey Kerr's "Cottage to Let" returns this week to the Opera House, where it opened a year ago. Its continued success is well deserved and not hard to understand, for it offers "escapist" entertainment of high quality in an artful and quite unexceptionable form. It is, in fact, a play ostensibly about this war whose plot is entirely in the tradition of the spy melodrama of bygone days; than which nothing could be less distressing to those who go to the theatre for release from a world that is too much with us. But if the plot is distinctly unreal the treatment and production are as up-to-date and streamlined as a Tornado or a Tomahawk. In place of the rich tones of melodrama we have the brittle scintillations of the lightest of light comedy, dialogue that is often brilliant of its kind, and a production that is a persuasive model of the modern drawing-room school.The only lapse is the scene in the cliff-top bungalow, where the plot thickens too much to be amenable to the naturalistic touch; and a brilliant closing scene makes up for that. As the boyish, wool-gathering scientist hero Leslie Banks has a part in his sleep. Gillian Lind makes a delightful study of his still more scatter-brained wife. But the honours for sheer acting go to George Cole as the evacuee boy who unmasks the villain. That Alistair Sim can play that villain is an index of the play's frivalous spirit, yet one cannot believe it of him, though he does it very well. Among the minor characters Charles Mortimer stands out in the beautifully written part of a county Chief Constable. Exeter and Plymouth Gazette - 4 April, 1941. Theatre Royal, Exeter. 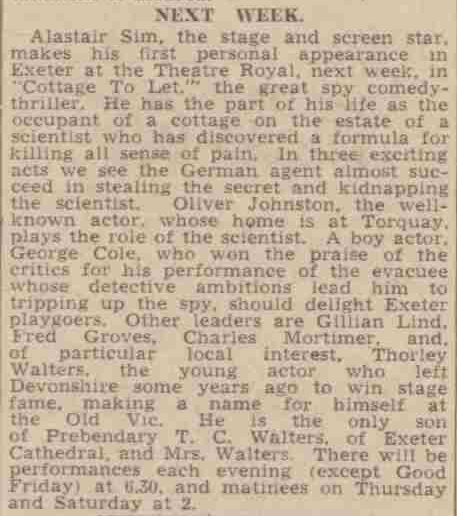 "A boy actor, George Cole, who won the praise of the critics for his performance of the evacuee whose detective ambitions lead him to tripping up the spy, should delight Exeter playgoers. Other leaders are Gillian Lind, Fred Groves, Charles Mortimer, and, of particular local interest, Thorley Walters......."
The Stage. Lyceum Theatre, Edinburgh. "Full acting honours are shared by Alastair Sim and Leslie Banks, who play their respective roles with skill. Gillian Lind is delightful as Helen Barington, and George Cole gives an outstanding performance as the young evacuee. Other parts are capably handled by Fred Groves, Pamela Neil, Charles Mortimer, and Richard Williams." Birmingham Evening Post - 2 September, 1941. DUDLEY HIPPODROME Cottage to Let.” Geoffrey Kerr’s comedy thriller, at Dudley Hippodrome, unfolds a spy story of the present war. The cast and production are the originals from Wyndham’s Theatre, London, with Leslie Banks in the part of John Barjngton, an eccentric scientist who discovers a formula for killing all sense of pain. 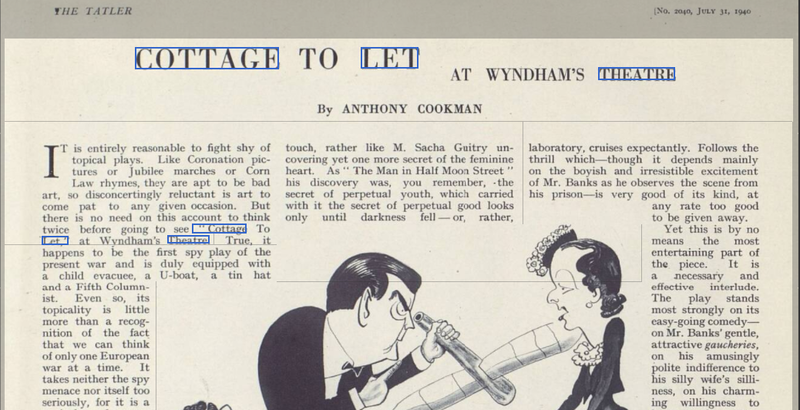 The unconventional spy in the play is Alastair Sim. 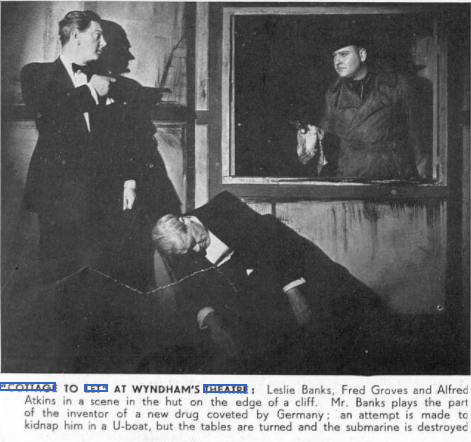 The part of Barington’s wife is taken by Gillian Lynd, and other characters are by George Jean Short, Fred Evans and Charles Mortimer. 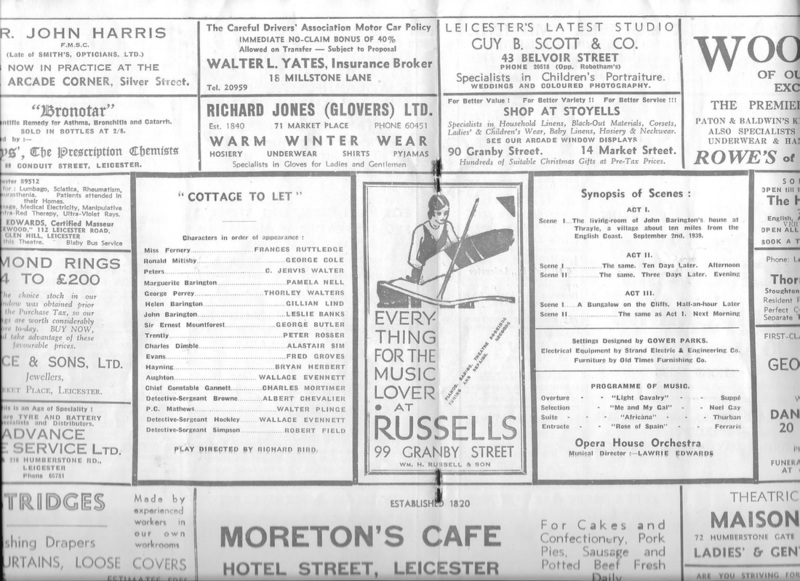 From The Nottingham Journal of 27 November, 1940. 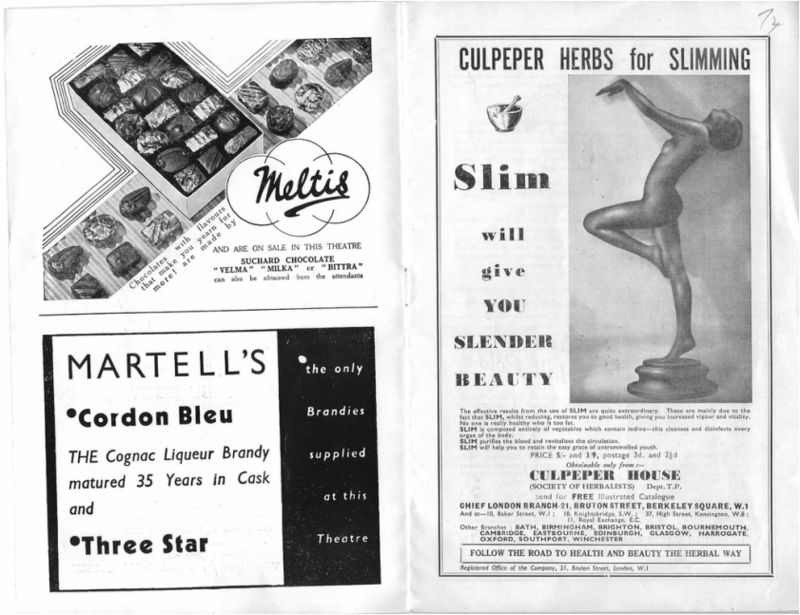 Bath Chronicle and Weekly Gazette - 13 September, 1941. "Other important members of the cast include George Cole, the boy actor, Fred Groves, Charles Mortimer, Jack Watling and Jean Short." 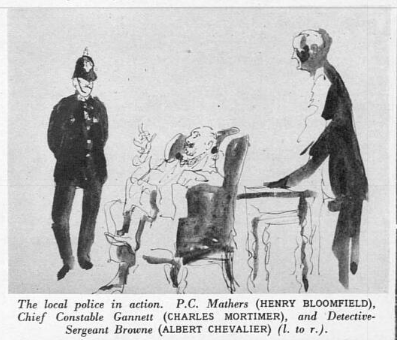 From The Sketch - Wednesday 28 August 1940. From The Daily Record - Tuesday 05 November 1940. 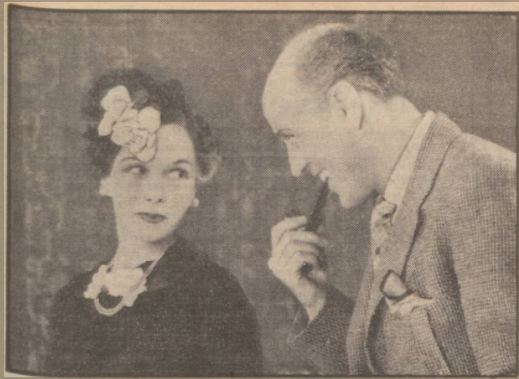 From The Tatler - Wednesday 31 July 1940. From The Bystander - Wednesday 14 August 1940. 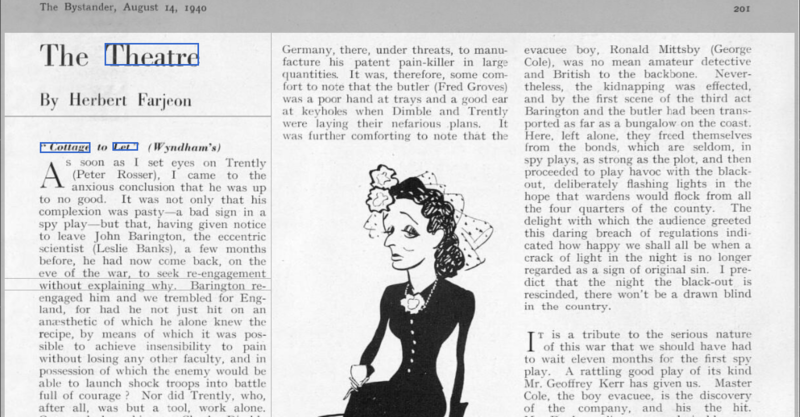 Cartoon caricatures of well known playes were reproduced in newspapers of the day. 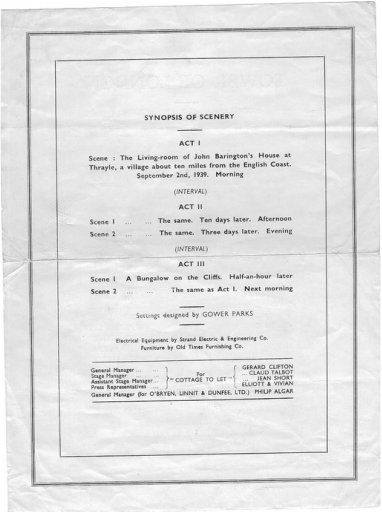 This sheet is taken from a programme, supposedly, from the play staged at the Prince of Wales theatre in Birmingham. 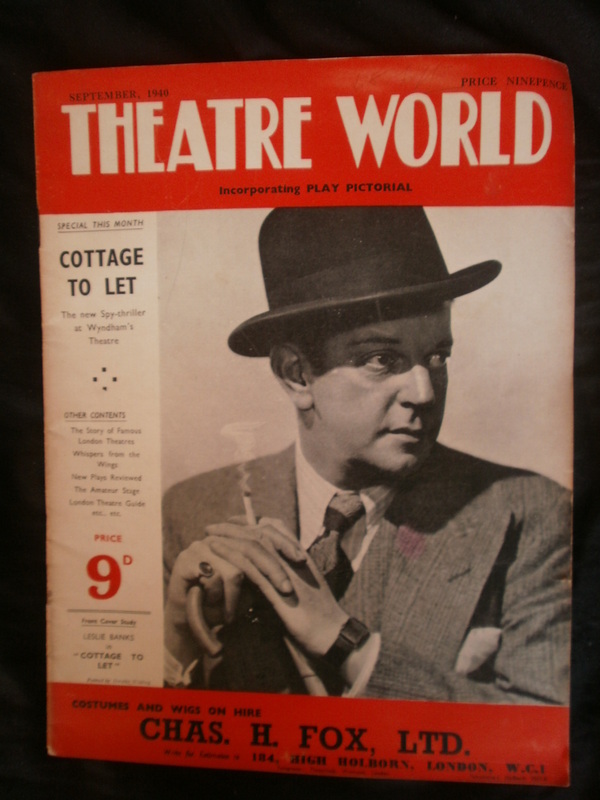 Theatre World from September, 1940, with its feature play, "Cottage to Let", starring Leslie Banks, Alistair Sim, George Cole, and Charles Mortimer, at the Wyndham's Theatre. Charles Mortimer, as the "irascible" Chief Constable Gannett, far right. .... and the Theatre Royal, Bath. 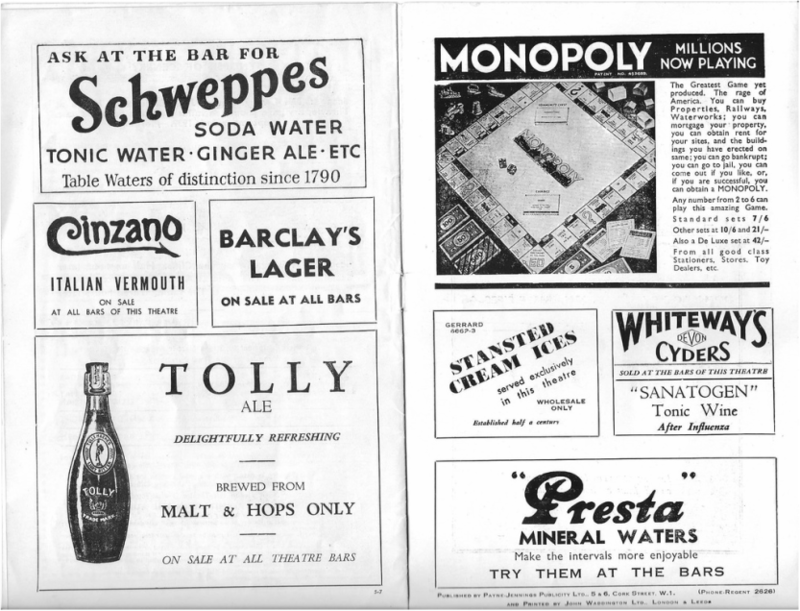 Newspaper article from the Bath Weekly and Chronicle 13 September,1940. Taken from the Devon and Exeter Gazette, 4 April, 1941. From The Yorkshire Evening Post - Tuesday 23 September 1941. From The Sphere - Saturday 10 August 1940. From the Yorkshire Post 23 September, 1941. 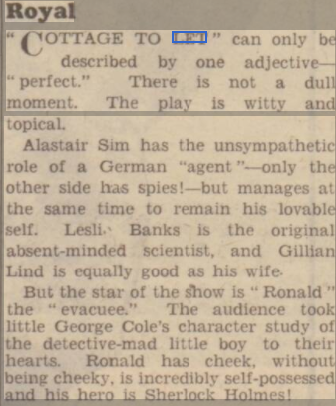 ​Alastair Sim is at his best parts that allow him a certain malevolence and it he first appears as a genial author in " Cottage to Let" at the Grand Theatre, Leeds, this week, it is not long before he reveals himself as particularly desperate German spy. The high, bald forehead, the rolling, flashing eyes, the satanic grin that make this man news all his parts fit especially well into Alastair Sim's portrayal of Charles Dimble. He has an easy foil in John Barington, who has discovered liquid that will put pep into storm troops. The careless charm Leslie Banks brought to the part led him into the very demonstration that enabled Dimble to spirit him off to a lonely hut with a German submarine waiting at the bottom of the cliffs to take him away. 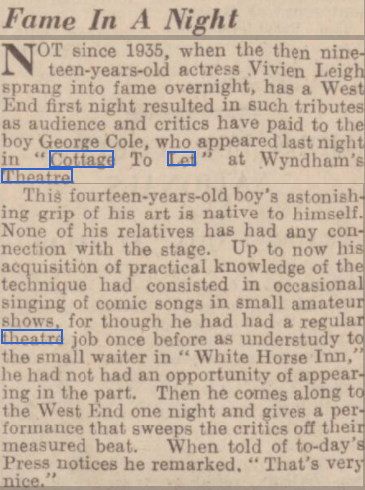 Fortunately, Barlngton was guarded not only by Evans, a policeman masquerading as a butler, but by his London evacuee, played with precocious perfection by 15-year-old George Cole. If young Ronald Mlttsby had been torn from his beloved East End complete with gas mask he was still a budding detective with plenty of material ready hand. A realistic thunder set the theatre echoing as a young R.A.F. pilot blew the submarine destruction after the faithful Evans, kidnapped with Barlngton, had signalled from their prison hut and been shot doing so. But there is more than one murder in this quite gripping comedy-thriller. 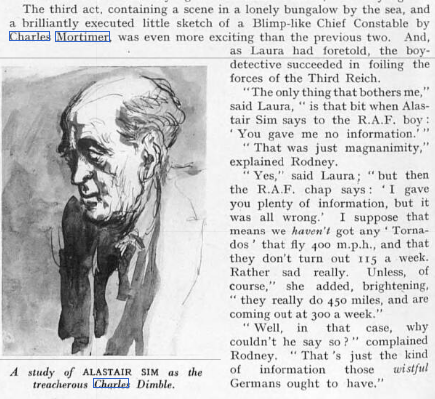 The third act was enlivened —and almost stolen —by Charles Mortimer's excellent study of the local chief constable, the man who objects to the Home Office's " damned interference " with his lovely double murder. Gillian Lind is a delightfully vague Mrs. Barlngton and George Butler a restrained friend of the family. From the Manchester Evening News of 9 July, 1940. Opera House, Cottage to Let. Scientists who invent drugs which conquer pain must expect the Germans to kidnap them with the help of spies and U-boats. A German army composed of soldiers who couldn’t be hurt would be just what the Doctor Goebbels ordered. 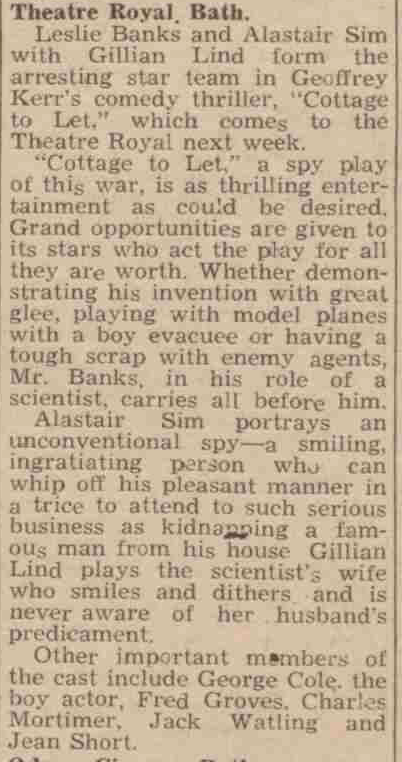 And audiences who are introduced to that sort of scientist must expect a boy detective (evacuee) to take a leading part in unmasking the aforesaid spies. Stuff and nonsense of this sort can be so embellished with happy dialogue that it scintillates, but that, alas, is not the case here, and one is left to regret the squandering of a cast headed by Leslie Banks, Alastair Sim, and Gillian Lind. Mr. Sim, writhing and giggling, does his best for the leading spy, and Mr. Banks almost makes one believe in the scientist, Fred Groves has his moment or two as a policeman disguised as a butler, and Charles Mortimer gets every ounce out of a dunder-headed Chief Constable. This last is a beautiful little piece of burlesque, and had more of Cottage To Let been on these lines it would have been to everyone’s advantage. 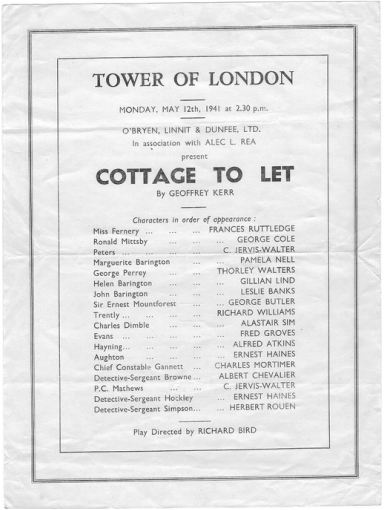 The cast of "Cottage to Let", by Geoffrey Kerr , presented at the Lyceum Theatre last night includes Alastair Sim . He is in the part of the amiable, innocent, sunny-hearted elderly gentleman who comes as tenant of the cottage in the grounds of the house of an eminent surgeon. The part is not Scots ; but it gives full opportunity for Mr Sim's particular style and his admirable technique . 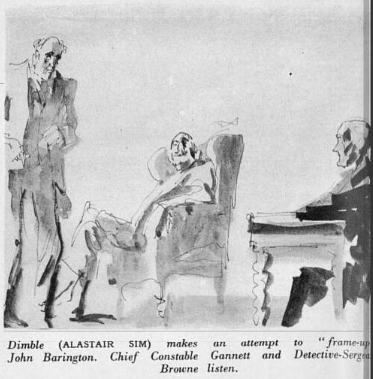 The part might easily become mechanical, with a touch perhaps of the sinister, but Mr Sim makes Sir Charles Dimble—one thinks of Dingley Dell , and the similarity of sound is not misleading in suggesting a Dickens character—a very definite personality . As the simple-minded gentleman, so full of the zest of life, so easily interested and amused, he has no difficulty in establishing himself in the household of Barrington, the eminent scientist, who has just discovered a wonderful anaesthetic process that leaves the faculties as they were while completely eliminating pain. 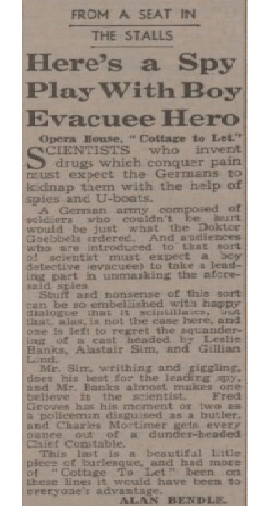 It is this discovery that has made him interesting to the German Government; and there is an elaborate scheme to kidnap him, so that he may make the drug in bulk for the benefit of the German shock troops. The play consists mainly of Charles Dimble and up-to-the-minute thrills , including the realistic bombing of a U boat off the coast. Mr Dimble visibly wobbles with goog nature and affability . He is, one might suppose , an amiable oddity, whose sunny optimism is a tonic in these depressing days . 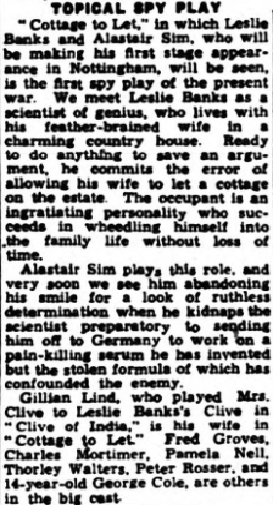 But even when he reveals himself as an astute an entirely unscrupulous German agent , Mr Sim's acting still carries conviction. The deep voice fits the character creation. In the last two scenes, when the play's thrills reach their peak , the only regret is that Mr Dimble is for the most part in abeyance, until his final discomfiture . This takes place largely through the acumen of a remarkably acute boy, whose patron saint is Sherlock Holmes. An unexpected upsetting of a table , a quick abstraction of Mr Dimble's pipe from the pocket of the loose coat which he wears with such a negligent air of comfort , and the production of the incriminating paper concealed in the pipe-stem, and the exposure is accomplished. The real Holmes touch! 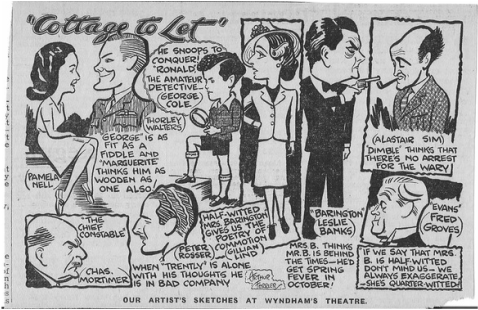 George Cole is Ronald, the very noticing and deductive boy, who comes to Barrington's house with a label as an evacuee. Leslie Banks, as Barrington, also gives us character interest . He is the detached, impatient, unconventional genius , difficult and resentful of intrusions by strangers but calling easily to the knowledgeable Ronald, a relationship being speedily established comparable to that of the great Sherlock and his youthful assistant. There is an extension of the plot exhibiting a pompous country Chief Constable and his right-hand man in a quite impossible display of obtuseness, ready to arrest the victim of the plot instead of the chief instigator. But fortunately Ronald has seen to it that the latter does not go away as planned . The large audience last night were excellently entertained. Gillian Lind gave an amusing study of the scientist's wife . Fred Groves as a policeman-butler, and Pamela Nell, Thorley Walters and others in the numerous cast made the wheels go round with perfect smoothness. Mr Banks at the close acknowledged the applause of the audience . From The Liverpool Daily Post - Friday 02 August 1940. From The Daily Record - Monday 04 November 1940. 24 February, 2019. ​I have just watched and recorded the film version of Cottage to Let, made in 1941. 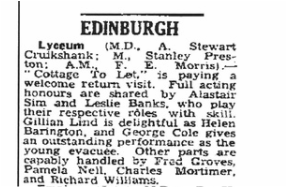 Among the cast are Leslie Banks, Alistair Sim and George Cole, who were also in the stage play, performed in 1940 (see details in the Theatre section). 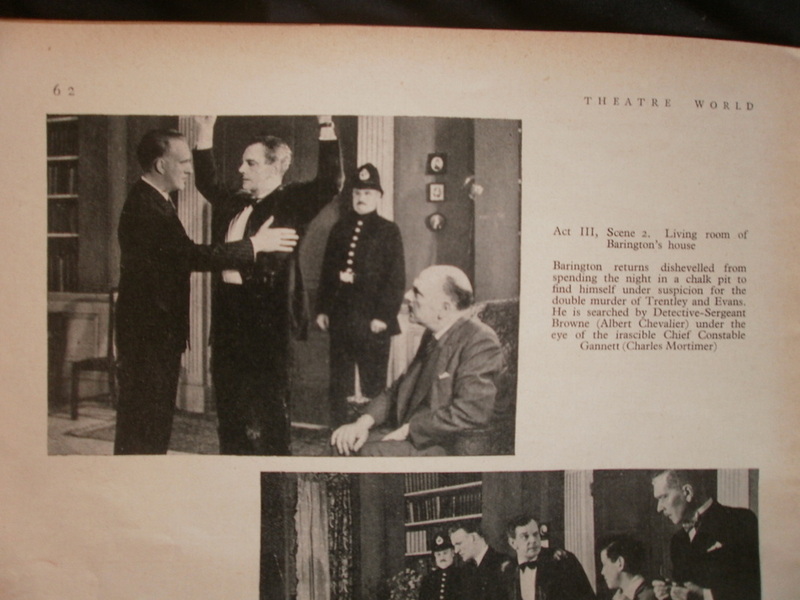 Charles Mortimer played a police detective with success on the stage, but was not involved in the film. Interestingly, however, also in the film cast was Michael Wilding. I remember my mother telling me that Charles' wife, Greta Wood (my grandmother) wrote to Mr Wilding in the 1970's, congratulating him on his knighthood. Mr Wilding, who I believe lived in Buckinghamshire/Oxfordshire area, close to the cottage, replied with a nice note thanking Greta for her kindness, but informing her that she was a little premature, he had not received a knighthood.